Getting a package in the mail is usually an exciting occasion – especially when the package is full of cannabis accessories. The subscription box model is becoming a popular way to keep up with your favorite industries and get products delivered straight to your door every month. The cannabis industry is no stranger to subscription boxes either, but one company continues to stand out and draw consumers in with fresh designs, accessories and monthly themes. We’re of course talking about Hemper! We recently had the pleasure of opening up a Hemper box full of goodies and will be sharing our feedback on their February UFO Box. While we’ve only reviewed February’s box, it’s important to note that Hemper offers a monthly subscription where consumers can receive a new box each month. Additionally, all of the boxes from past months are available for sale on Hemper’s website in case you’d like to purchase a box you may have missed out on! 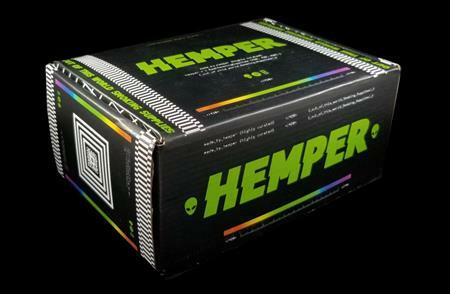 Another important aspect to note is that, in our opinion, Hemper boxes are best suited for beginner consumers or people interested in building up their collection of cannabis accessories and consumption essentials in a way that is both fun and affordable. If you’re in the market for high-end glass or top-of-the-line accessories, you may want to explore other avenues. That being said, Hemper boxes and subscriptions are great for a wide variety of cannabis consumers and make excellent gifts as well. Our review team put the contents of the Hemper box to the test with some basic flower consumption and the results were pretty consistent. The Twisted Hemp ‘Just Hemp’ wraps were great for rolling larger blunts perfect for a long session or a big group. The OCB papers functioned just as we expected and burned slow and evenly without any harsh paper flavor or taste. Both of the Hemper Tech products work great as well. The odor eliminating spray helped quickly diminish the cannabis smell from a smaller-sized room and the Freshwipes did their job when faced with a little concentrate reclaim – although they could have had slightly more moisture in one reviewer’s opinion. When we tested the UFO rig, we did have a bit of trouble dialing in the correct water level. Since the inline percolator is down-gridded and almost exactly level with the joint, we encountered a bit of a high water level beneath the bowl, resulting in the bottom of the slide getting slightly wet/covered in resin as more hits were taken. While this isn’t a major inconvenience, it definitely impacts the smoking experience and requires the piece to be cleaned more frequently to avoid the slide becoming overly coated with flower resin. Despite the slight water issue, the piece functions pretty well for the price and is super easy to clean. In regard to the Hemper silicone debowling ashtray, we found the width of the debowler was a bit too thick – at least for the bowl provided with the UFO piece. It worked much better when the bowl was fully cashed as opposed to a bowl with some blackened or charred cannabis flower inside. When we tested the ashtray with a different slide that was a bit wider it seemed to work a lot better. In terms of the overall ease of use for each of the products found in the Hemper box, you really can’t go wrong. No matter the experience level, everything inside of Hemper’s UFO box is fairly straightforward and ready to use right out of the box. Of course, the rolling papers and hemp wraps do require some know-how to use correctly but for anyone who knows how to roll properly these products are truly great and provide an enjoyable smoking experience. Even the Hemper torch comes prefilled and ready for use straight out of the gate. 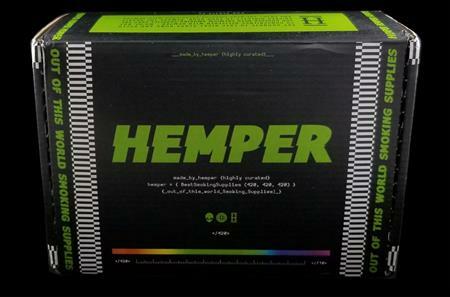 As we mentioned earlier, the Hemper box is great for beginner consumers who don’t want to deal with the complicated nuances of cannabis consumption. With Hemper, all one needs to do is open their box, collect all their accessories and start putting them to use. Seriously, it’s that easy! The simplicity of the Hemper box is one of the main reasons it appeals to so many consumers and the variety of products ensures that there’s something for everyone at a price that won’t leave a hole in your wallet. Upon receiving the Hemper UFO Box, we were immediately drawn to the attention to detail incorporated into the design. It is clearly evident that the Hemper team works hard to make sure each month’s boxes have fresh, appealing designs that are aesthetically dynamic. The UFO Box design really did feel “out of this world” and it was a nice touch to see such effort put into the packaging. Moving onto the actual opening, once we lifted up the lid we could see the box filled to the brim with Hemper products. This is truly an exciting moment for any cannabis consumer who enjoys accessories. Just seeing a box packed full with products is an enjoyable experience, especially when you’re unaware of what’s inside. After removing all the protective packaging and taking a look at all of the contents, we were pleasantly surprised to see some great consumer essentials in the mix. 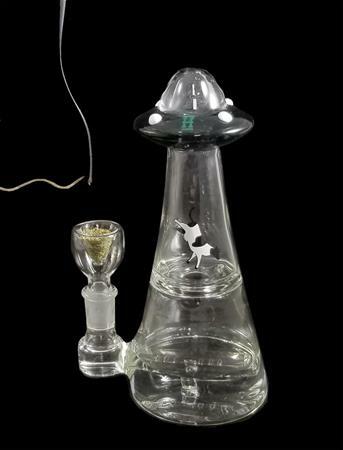 Of course, the centerpiece is the “UFO rig” with a cow decal cleverly placed to simulate an alien abduction. The rig is nothing special, simply meaning you won’t see it gracing the shelves of high-end glass collections, however, for a starter piece in a cost-efficient collection of other accessories it truly is a great value. 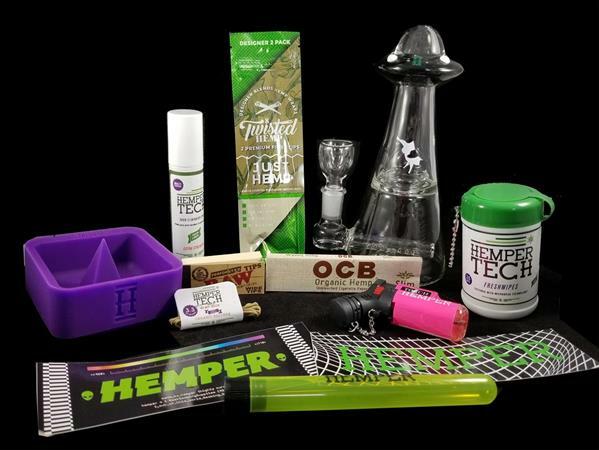 The rest of the box contents are downright necessary in any cannabis consumers smoking accessory arsenal and the Hemper packaging brings all the products together in a way that is sophisticated and clean. When it comes to value, there is no better option than Hemper. With a Hemper subscription box sign-up (options for monthly, every 2 months, every three months), consumers pay just $29.99 per shipment and receive over 10 cannabis accessory items – talk about a great deal! As discussed above, nothing in the box is more valuable than the price tag, however, the cost is exceptional for consumers wanting to get the most bang for their buck and build out a hefty collection of cannabis accessories. Plus, with a new glass piece in every box, one can fortify a fairly inexpensive glass collection that functions well and offers versatility for both flower consumption and dabbing. In addition to the affordability factor, the value of a Hemper box exceeds just the price. By curating an assortment of useful cannabis accessories, Hemper allows any inexperienced consumer to easily equip everything they’d need for an effective smoke session. This is something that is often overlooked by more established consumers and where many new consumers struggle understanding in their first few months of becoming familiar with cannabis consumption and the surrounding culture. We often get asked what’s needed for beginners to consumer cannabis and Hemper truly provides a great option for these types of people. No longer do they have to wander through head shops trying to find the right products. With a Hemper box, a new consumer can simply purchase a box, open it up and get to consuming! Ultimately, Hemper’s UFO Box provides a ton of value at a low cost and the while team was able to find aspects they enjoyed. From connoisseur to beginner, odds are there’s something inside a Hemper box that’ll be useful. The appeal for beginners is obviously higher but we really admire Hemper’s efforts to cater products toward this demographic as we get a lot of feedback from new consumers who feel overwhelmed by some of the more high-end products. From a sleek design all the way down to carefully curated products, we were impressed with our Hemper box and would definitely recommend it for anyone looking to receive installments of fun cannabis accessories on a recurring basis. Visit Hemper’s website for more information.